It is no secret that good health and financial security go hand-in-hand. Improving health outcomes for Aboriginal people of the region means also improving their opportunities for employment, which is why two of Newcastle’s key Indigenous organisations, the Aboriginal Employment Strategy (AES) and Awabakal, have formed a partnership that aims to deliver tangible positive results for the local community. The partnership has been driven by an AES national strategy to work with more Aboriginal businesses and organisations around the country, and has already led to 35 placements of Aboriginal people at Awabakal by the AES since November 2016. “The AES and Awabakal share a mutual purpose of existence, both organisations work towards creating social impact. We want to show that through collaboration we can achieve more, we’re combining our respective areas of expertise to support local people and grow Aboriginal employment opportunities and Aboriginal business, together,” says Leroy Wilkinson, AES Manager, People and Culture. Founded in Newcastle in 1977, Awabakal is an Aboriginal community controlled health service that delivers culturally appropriate primary health care services, advocacy and social and emotional support to Aboriginal people. Awabakal is also the largest employer of Aboriginal people from the local area, currently employing around 100 Aboriginal staff. Awabakal offers opportunities in a growing number of positions across a wide range of sectors, including medical, transport, aged care, early childhood, and mental health, among others. “From the Awabakal point of view, the AES partnership allows us to recruit local Aboriginal people through an organisation with extensive contacts and a proven record of mentoring and preparing people for work. 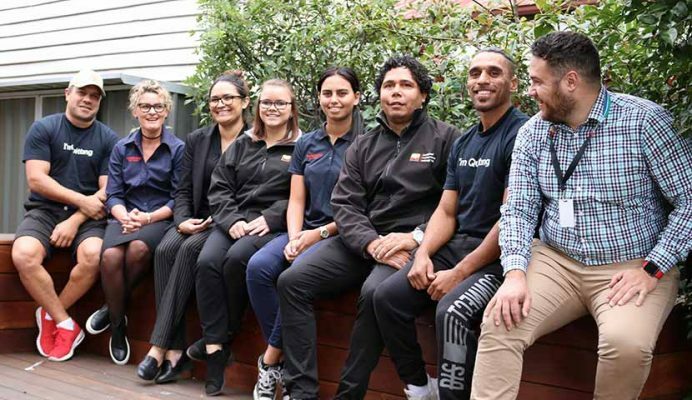 Not only are we supporting another Aboriginal organisation, we’ve gained some great employees who have a passion for working in this sector, and that can be hard to find,” says Awabakal CEO, Raylene Gordon. The partnership between the organisations has been shaped by the AES’ holistic approach to recruitment which includes supporting clients to identify and overcome broader challenges. For example, if an AES client is facing issues with housing, or issues with health, the AES will work directly with Awabakal to address those issues. AES recruits also receive up to six months of mentoring and support after their placement at Awabakal, meaning they are more likely to move into positions they are most likely to succeed in and enjoy. As well as significant recruitment into existing positions at Awabakal, the two organisations have worked together on identifying and creating new positions entirely, such as an all new Community Liaison position created to achieve closer grassroots promotion of Awabakal services and personalised support for local people. 27 year-old Aaron Simon is one of Awabakal’s recent recruits through the AES and one of two new Awabakal Community Liaison workers. The position is Aaron’s first full-time job and one he’s excelling at after nine months in the role, despite having no prior health work experience, proving him to be one of the major success stories of the partnership so far. Aaron has now joined Awabakal’s Tackling Indigenous Smoking team and is about to complete a Certificate IV in Mental Health. “When I went to the AES I was desperate for any work at the time, I didn’t have any experience working in health, but the opportunity at Awabakal came up and I thought I’d give it a shot and it’s been great for me,” says Aaron. The valuable employment and mentoring services provided by the AES are supported by the Department of Prime Minister and Cabinet.